Digital version reviewed. An array of control options exist- responsive tilt controls on the Wii Remote or GamePad, and traditional joystick controls on the GamePad or Pro Controller. 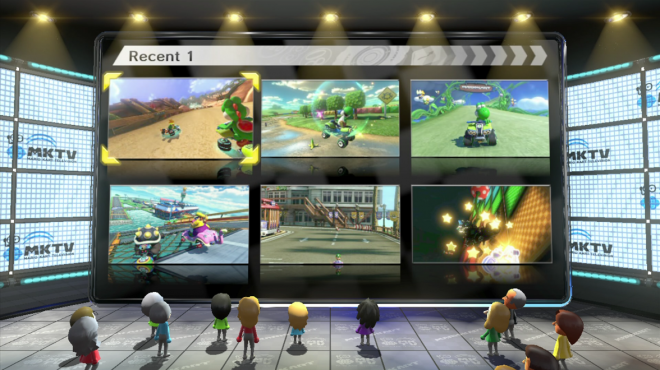 Off-TV play exists as a replica of the TV image, though the GamePad can also be used to display a track's map or your vehicle's horn. Notably absent is the ability for one player to view his/her screen on the GamePad while the other uses the TV, online or otherwise. Nintendo, keen to keep its home console alive, has gone back to the well with an installment of the faithful 'Mario Kart' series for the Wii U. 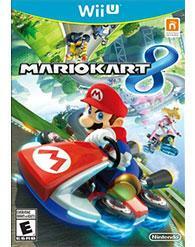 'Mario Kart 8' throws anti-gravity karts into the mix, while grabbing at the 3DS incarnation, 'Mario Kart 7,' as inspiration for both the online offerings and increased kart customization. Topping it all off, this is the first Mario Kart to go beyond SD. With HD visuals and modern sharing features, this all-time party series makes its case for the Wii U's continued survival. In the past, as you dunked into an off-track pond or veered carelessly off a precarious edge, 'Mario Kart's' resident savior, Lakitu, would sluggishly fish you up and place you ever so gently onto the track. I never knew this, but he's sort-of been a reflection of the pace of those incarnations in the Nintendo derby. 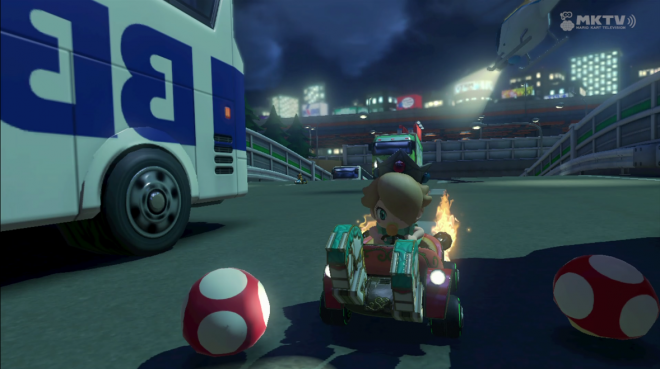 Nowadays, on the eighth trek into Mushroom Kingdom's raceways, Lakitu is running on nitrous oxide, not for more than a moment allowing racers off the course, urging you forward, into the careening curves and blasting boosts, into the magnificent and skillful fray 'Mario Kart' has now become. The pace is relentless, the tracks are dangerous, the need for precision higher than ever, just about every change to the formula in 'Mario Kart 8,' subtle or not, tips the scales ever so slightly in favor of the more talented players. Lakitu's newfound urgency might seem a crutch, but really he's telling every racer he's not saving to step up their game, as their game is most certainly in need of some stepping. 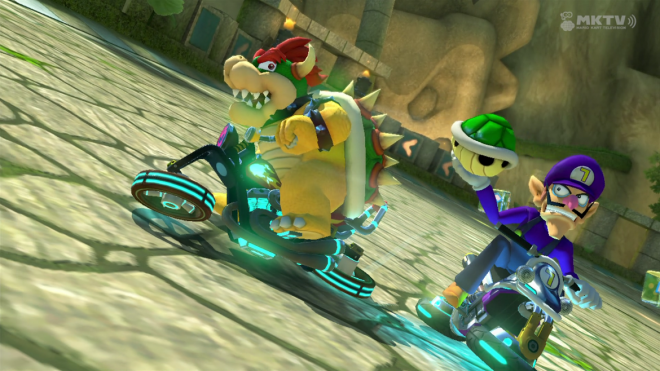 Like 'Mario Kart 7,' the first thing you do is choose a character and design a kart, though this time around the Wii version's motorcycles return and ATVs are introduced. Pick a chassis, throw on some wheels, show your flair with a fancy glider, and see how it all plays out on the course. The bikes dip into drifts almost immediately, while the heavier karts and ATVs tend to slide a bit more in the wayward direction before righting. Throwing Bowser or Donkey Kong into the mix amplifies this effect, while the wee babies are as nimble as they are adorable. On the track, drifting, as ever, remains key. Taking a turn with whatever setup you've chosen with forethought and a desire for that resulting small speed boost is how a good player overcomes those pesky shells. The tracks on offer are zippier and zanier than ever, asking that you glide into banking turns while, say, avoiding a migrating herd of cows, which are ascending in population as you navigate the returning Moo Moo Meadows. The difficulty with which you can link those boosts together has risen to palm-sweating delightfulness. The result is a game that fully embraces the chaos, but also encourages its successful navigation with a lot of skill and a little luck. There has always been drifting and there have always been boosts, but there have never been this many, and finding a successful drift has never been more important. To this effect, items have been toned down slightly, yet still remain a boon to those stuck in the middle of the pack. Take the new Pirannah Plant, which sits at the fore of your vehicle and chomps at anything in your way, be it a banana or koopaling. This, along with the boomerang, mark a larger emphasis on middle-ground items, rather than the painfully overpowered super star or bullet bill, which are both dramatically nerfed. Even the shells seem slower, granting potential more time to react and somehow outrun those red homers. And finally there's the horn, the first and only item to have ever felled the dastardly blue shell. If that's not a sign of Nintendo's desire to even out the hand-holding of 'Mario Kart' past, than nothing ever could be. Yes, the opportunity to destroy that homing missile is rare, but just that the possibility exists, and the opportunity does occasionally arise, is enough to give longtime haters of the equalizing item (read: everyone) a beacon of hope as they seek a first place finish. The most overt addition to the formula, the anti-gravity track sections, isn't so much a strategic concern as it is an excuse to literally flip these tracks on their head. The camera, outside of some tasking transitional moments, is always right with your character's point of view, which means flipping your wheels and hovering up a waterfall on Shy Guy Falls is just about the same as driving on tar, except you're going up a waterfall and the piranha plants to your left are close to hanging upside down. It’s in those transitional moments, though, as the entire world seems to rotate around you, that you realize the wacked out nature of these sections. It's just screwy enough to excite you every single time. But like the gliding and underwater sections, which return after a successful bout in 'Mario kart 7,' the anti-gravity sections do offer a slight, yet certainly important, shift to your boosting ambitions. Crashing into enemy racers while hanging upside down grants both of you a boost, as does pinballing into designated blue bumpers. It's small, like the exaggerated underwater tilting and brief gliding, but it's yet another of many opportunities for advantage along these delightfully complex courses. Cloudtop Cruise has you bounding from clouds to flying wooden ships, and the new Bowser's Castle suffers the thundering rage of a massive Bowser statue. In any given course, you may zip up a wall in order to avoid some obstacle, or burn a boost upside down while dashing to the next speed-boosting coin or high-flying jump. Not a single stretch is wasted, and that includes coins, jumps, bumpers, gliders, water, obstacles. Even in its eighth iteration, the game's track design reflects practice and refinement. Shortcuts are always a risk, but always redeeming in their successful navigation. Even the revitalized older tracks sport a new sheen and anti-gravity moments of their own, embracing the maniacal pace of 'Mario Kart 8' over its original game. The visuals aren't just crisp and 60 frames-per-second smooth, they're absolutely voluptuous in imagination and color. This is Nintendo's most glorious realization of the Mushroom Kingdom yet, absolutely exploding and dense with charm, bright-eyed fantasy and impeccable precision. The diversity is there too. You'll zip by head-bouncing piranha plants in the rave-happy Electrodome and essentially ski down Mount Wario in a track broken up by segments instead of laps. And it's not just the sprawl of the environments that gets you, it's the detailed and often hilarious character animations that draw you ever closer to the experience, especially in the mega slow motion replays tailing each and every race. You might've seen the Luigi death stare online by now, his furred eyebrows dangerously peering to his opponents as he menacingly drifts by, but every character, even the seemingly drab koopalings, is wildly emotive. 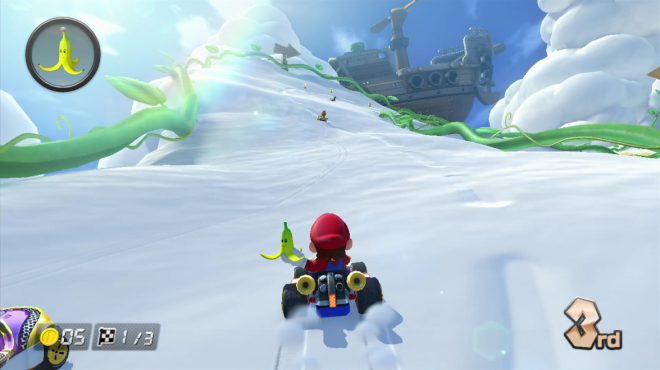 That you can capture these small moments in the Mario Kart TV replays is a testament to both Nintendo's confidence and desire to show off the beauty of this game to the masses. It turns out Nintendo can do HD quite well. On par with the visuals in both imagination and diversity, the music and sound effects present in each and every moment bring 'Mario Kart 8' to vibrant life. And it's not just the matching of an appropriate tune to a track, or tracing an incoming green shell into a pained yelp somewhere off-screen, it's Nintendo's desire to engage the action on-screen with the sounds coming out of it. Tunes are sped up and modified in the final laps, even completely changed to a 'Super Mario Galaxy' reverence in the previously mentioned 'Cloudtop Cruise,' halfway through. And the theme music marks the furthest in Nintendo's trend towards jazzy-remixes for the Mario brand, alleviating any and all tension and seriousness in the opening acts of your experience. Avid viewers of 'Saturday Night Live' may even feel a twinge of deja-vu as they turn the game on for the first time. With eight Grand Prix's, half of them four new tracks, half of them four dramatically remixed old ones, the content of 'Mario Kart 8' is basically on par with the last few installments, albeit with improved incentives in the form of an expansive roster and plentiful kart part unlocks (you earn them by collecting coins during races). Local multiplayer ensures this 'Mario Kart' is just as party-friendly as past incarnations, and the time trials and challenging Grand Prix's keep the single-player experience fully engaging. More so, the online offerings have become more robust than ever, if not quite rivaling the expected norm in modern racers on other consoles. Up to two local players can play online at a time, engaging in worldwide or regional 12-player races, tournaments with altered rulesets, or a private, friends-only lobby with in-game chat. It would be nice to lobby up with friends before joining in worldwide matches, but you can join them mid-race through the menus anyway. The only real dud, mode-wise, is Battle Mode, which has players attempt to eliminate each other with items on one of eight tracks in the game. Without the traditional arenas, this mode is a drag. Mario Kart TV is Nintendo's 'Mario Kart' YouTube, allowing players to upload, browse and generally share highlight reels of their best (and sometimes worst) races. While Nintendo's automated editor is quite good at picking out the best moments in a match, often tracking devilish red shells on their destructive paths and capturing the most daring drifts, it would have been nice to cut the footage myself. The internet has already taken to the gif factory with 'Mario Kart 8,' and breaking down these reels into three or four second glimpses might have been better than what's on offer. That said, it's still a blast to hone in on the action in the aftermath. As you can also post these videos on Miiverse, stamps, as usual, are on offer. You unlock them by completing Grand Prix's with each and every character, a further incentive to master the game. As a bona fide Nintendo staple, coming off its most successful home console release in the Wii version, refinement has ever been the call, and now on the Wii U the series has arguably reached its most polished state while boasting both HD visuals and a robust set of online capabilities. Somehow both frantic and balanced, lovers of the series will find the absolute best the series has ever offered, and newbies are lucky enough to still have 'Mario Kart' in such remarkable form.